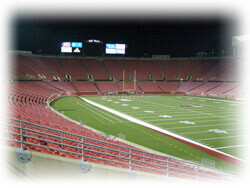 Most businesses in the pressure washing field consider stadium cleaning as the hardest job they ever tackled. The first challenge in cleaning a stadium is having the right tools and equipment. It is important to have a pressure washer that has the right pressure -- one that has enough and not too much. Big tanks are also needed, so there is no need to fill them up all the time. Fully functioned hot water pressure washers are another important tool. It would be best if you have one with a charging system which will keep your batteries powered at all times. The hoses are another part of stadium cleaning everyday struggles. Hoses are usually tangled on chairs and you might be around 70 feet down and have to go up to untangle it. Since the seating at the stadium is at an angle, it is draining to move the hoses' weight up and down, especially if you are using a two-wire hose that is twice as heavy. The moment you have to pull your hose up to the top, you are already tired and have to sit down as your heart pounds. The nearness of hard and delicate surface cleaning also adds a challenge in agility. As a stadium cleaner, you have to clean all the reachable concrete using a nozzle, then you need to take off gums under the seats. Once you finally begin getting next to the cupholders, you need to angle your nozzles while at the same time preventing the stickers in the cupholders from being damaged. Another factor that makes stadium cleaning quite difficult is the heat. Since using chemicals can add to the risk and expense, you have to depend on pure heat and pressure to have your job done. Because of that, you would probably feel like you are working in a sauna as you spray a pressure washer with hot water and have the sun shining on concrete without shade. Normally, most stadium cleaners only take a 30-minute break to have lunch. Their work day begins before sunshine because once the sun comes up, they always get shading effect from the stadium chairs, which makes the concrete appear like it is still dirty. Being a stadium cleaner requires tact and you have to depend on your instincts because the sun can blind you at certain spots. The sand at the stadium, which comes from the field and the concrete, is also another factor that can deepen your endeavor. Sand can get inside your boots so you have to strap your boots down to prevent sand from getting in and irritating your skin. Another consideration is access to the stadium. When there is a convention or game at the stadium, you need to work around it. Aside from football games, stadiums have several events that you should cope with. Power washer safety tips can be very helpful as well. The top, middle and bottom section of the stadium each possess little problems and issues for cleaning and hoses. Typically, the bottom section has the most mildew, sand and gum. Although stadium cleaning is a tough job, many cleaners still feel that being hired to do the cleaning task and doing their job well is a great accomplishment. If you want your stadium cleaning business to become successful, it is important to have great cleaners, appropriate tools and equipment, effective techniques and the determination to excel and give out your best on a day to day basis. Without great workers and procedures, stadium cleaning would be difficult to accomplish. These hot pressure washers are more effective than the cold water pressure washers. Advantages of direct drive and belt drive pumps.